Many people know at least something of the gradual flooding of the palaeolandscape of Doggerland, off the east coast of Britain. They have a pretty good idea of how the sea encroached on that early European land bridge from around 11000 BP until the final submergence between 8000 and 7500 BP, which cut Britain off from the Continent and made it the island we know today. In our labs we have bones of Pleistocene creatures which have been dredged from the modern sea floor, and as I have sailed over the expanse of water from Hull to the Netherlands, I’ve often imagined the lost lands of ancestors below the waves. If you are of a similar mind set, with your head in the future but your heart in the past, I bet you have too. There is a melancholy in thinking of those European hunter gatherers, living their lives on a landscape possibly not unlike modern day Norfolk, at a time when the great cold of the Ice Age was ending, yet all traces of their lives are beneath the sea. Those who settled on Island Britain would eventually issue in the Mesolithic period as we understand it from archaeological sites such as Star Carr. Yet little is known for certain of what was happening in Ireland at the same time. Arguments still rage over the possibility of a land bridge/s connecting Britain and Ireland which may account for the arrival of some of our faunal and floral species. However, it is generally accepted that if such a land mass did exist, it was in deep prehistory, and that Ireland has been an island for many thousands of years more than Britain. This early isolation accounts for the fact that there is not as wide a diversity of faunal or vegetation species in Ireland as Britain or Europe. 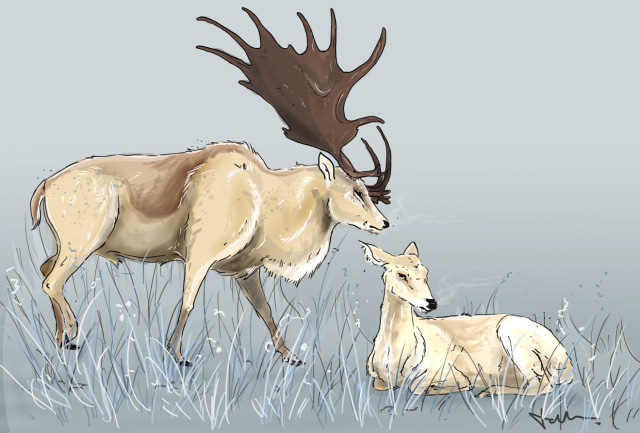 What we do know is that between the retreat of the great glaciers of the Ice Age and the Younger Dryas, Ireland was inhabited by reindeer (Rangifer tarandus), the mighty Giant Irish Deer (Meglaoceros giganteus), arctic lemmings (Dicrostonyx torquatus) and…bears. Hold that thought – they’re going to be very, very important to this story! Before we embark on this story, we also have to make a quick note here about using ‘cal’ and ‘uncal’ with reference to dates quoted! What comes out of an AMS (Accelerated Mass Spectrometer – the machine which counts those wee carbon atoms which are sampled for dates) is not an actual calendar date. The samples come out ‘uncalibrated’ – that is, presuming that the atmospheric radiocarbon percentages are the same as they are since 1950 (that’s the ‘BP’ you see used in science papers, for Before Present). But of course, since 1950s there is quite a difference in percentages from, say, 18,000 years ago. They had no nuclear testing, for one thing, and that makes a difference to carbon samples! Calibration is a complex process of calculations and adjustments to make ‘real’ date ranges, always allowing for a bit of error on either side of the presumed date. This calculation process uses probability to narrow the date range to the most likely span of time. There are two fine programmes, Oxcal and IntCal, which you can link to for much more information than we can fit in here. This was one of my ‘things’ at Masters, but I don’t want to bore anyone when there’s much more exciting things to mention here – because you want the bears, right? It has always been accepted that the first people settled in Ireland around 10,290 to 9,790 cal BP. Their lives were uncovered, painstakingly by some of the finest Irish archaeologists and led by the superlative Prof Peter Woodman, at the Mount Sandel excavations between 1973 and 1977. These early Mesolithic settlers chose their homeland well – Mount Sandel was on the River Bann, close to Coleraine on the north coast of Ireland. There are other Irish Mesolithic sites, of course, mostly clutching the coasts and lakesides of the island – Lough Boora, Rockmarshall and its human bone placed with shells in a midden; there’s Moynagh Lough with its bear bones; and the cattle and human bones at Ferriters Cove: but all date to after Mount Sandel’s occupation – or at least, so current knowledge says. That was then, this is now. Back in 2011, Dr Ruth Carden (no stranger to regulars of the Twilight Beasts twitter account!) was re-examining bone assemblages from the Alice and Gwendoline Caves, near Ennis in County Clare. Found back in 1903 during cave excavations by Scharff, those bones are very much part of the national heritage of Ireland, carefully conserved by the good folks of the National Museum of Ireland (NMI). 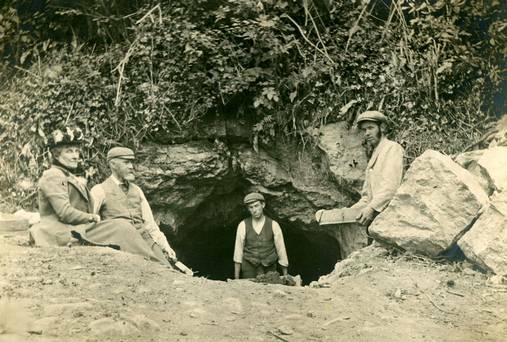 An image from the Independant.ie of the original excavation of the Alice and Gwendoline Caves, 1903. One of the bones, a knee cap (patella) of a bear showed signs of cutting and scraping by human hands. Dr Marion Dowd of Sligo I.T is a long term enthusiast and specialist of cave archaeology – so much so that her book, The Archaeology of Caves in Ireland, has been awarded Best Archaeology Book by the popular magazine, Current Archaeology. She suggested obtaining a date for the bone, as bear bones with modifications are pretty rare on this island; even the Moynagh Lough bear bones only suggest marrow extraction. The dates returned by both laboratories tallied with remarkable precision. When calibrated, they indicated a human being chopping a bear bone, between 12800 and 12600 BP. ……..2500 real, calibrated years before Mount Sandel. This all seemed just too remarkable – could we really have gotten the dates of the first people in Ireland so wrong? Why did we not consider the arrival of humans at such an early stage an almost sure thing? After all, settlers from the west coast of England and Wales could negotiate the shallow seas to expand their own territories, and Ireland was not very far at all. It was always possible that the bone was much older than the cut marks. The five cut marks were examined stringently by Ruth, and then further opinions sought from Dr Terry O’Connor (again, no stranger to the antler-bedecked cyber halls of the Twilight Beasts! ), Dr Jill Cook of the British Museum and Dr Alice Choyke. Numerous photographs were sent to two of the three specialists – Dr Cook actually got the ‘hands on’ experience of the bone – but with no details of the dates returned to avoid bias. The veteran zooarchaeologists were in agreement that the bone was likely not just some random bone used by a Neolithic sort to whet a flint. The cuts suggested a crushing action, such as those from a flint chopping at the surface around the actual time of bone exposure, i.e. death of the animal. There is weathering within the cuts on the patella too, and indications that the bone lay, likely discarded within sediment after the cuts were made. What we are left with would appear to be the story of a bear, slaughtered by humans, then butchered. The bones were discarded after stripped of meat and sinew, in a County Clare cave, almost 13,000 years ago. 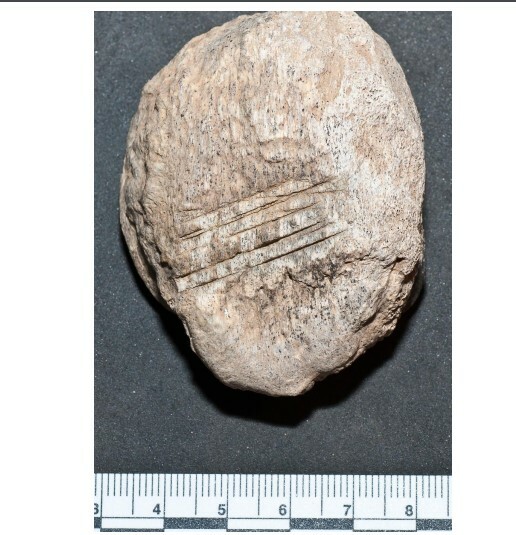 Does it indicate earlier Palaeolithic hunter gatherers? We genuinely don’t know. It’s going to take a lot of specialisation in zooarchaeology to create the platform for archaeologists then to look at interpretation. The cuts on the patella are clearly visible here. Photo courtesy of Dr R Carden. It’s a dramatic find, and accordingly, the boundaries of the Irish Mesolithic now must be looked at with fresh eyes because of the research of these two women, but hey, that’s how Irish archaeology rolls! On this day, the start of Museum Week 2016, it’s important to consider that this discovery would never have been made without the re-examination and identification of faunal assemblages, found during the 19th and early 20th century held within the NMI and Natural History Museum of Ireland (also known as the ‘Dead Zoo’). 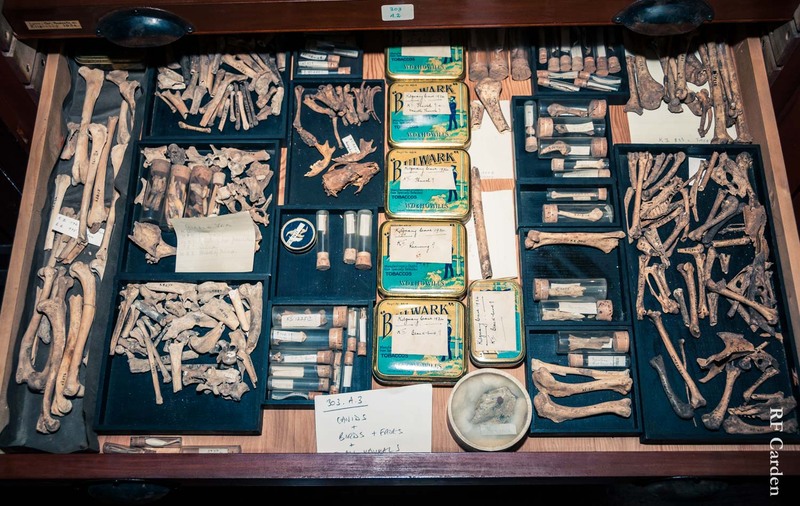 Dr Ruth Carden took on the task of going through each bone collection held by the Dead Zoo in Dublin as a labour of love. She is at around 20,000 bones and there’s still so many more to be looked at. In this case, combined with Dowd’s complementary archaeological speciality, the research has yielded an entirely new area of investigation into the Palaeolithic/Mesolithic boundary of human diffusion through Europe and England, ending in Ireland. The NMI and Dead Zoo, with their amazing staff of course are special to all Irish people, archaeologist and public alike – but all museums, worldwide, contain treasure, and not all treasure is gold or shiny. Sometimes it’s the kneecap of an ancient bear. Just one of the reasons all museums need to be protected, and cherished within communities as a whole. You have no idea what’s waiting to be discovered; misidentified, unclassified, perhaps even forgotten – and that’s the most exciting thing about this business. Museums hold not just the past, but the future. This wee little box sat for 100 years, taken care of by the museum, and always available should anyone have the interest to look at it. If anything, this really highlights the importance of long term safe storage for ancient material. You just never know until your curiosity and passion is stirred enough to make that call or email…..
What are you going to find in your local museum that will change science and the world? With special thanks to Dr Ruth Carden for the information provided for this post, and for use of the images. Scharff, R. F., Ussher, R. J., Cole, G. A. J., Newton, E. T., Dixon, A. F., & Westropp, T. J., (1906). ‘The exploration of the caves of County Clare’. Trans. of the RIA 33 pp 1-76. Oxcal have a super explanation of what they do, and calibration right here. As of course do my alma mater of Queens University Belfast with IntCal and CALIB, right here. This entry was posted in Brown Bear, Homo sapiens, Irish Elk, Mega-flood and tagged Brown Bear, Ireland, Megaloceros giganteus, radiocarbon, Rena Maguire, Ruth Carden. Bookmark the permalink.